The American Dental Hygienists’ Association strives to support dental hygiene professionals throughout their careers and advocate for the profession. Ultimately, through our collective efforts, we want dental hygienists to be valued and integrated into the broader health care delivery system to improve the public’s oral and overall health. 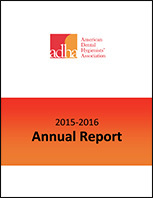 To this end, each year, ADHA publishes an Annual Report for our House of Delegates (HOD) highlighting the organization’s strategic initiatives and accomplishments of the past year. Each edition provides reports from the President, CEO and COO on programmatic activities for that calendar year, along with financial information from the approved audit for the previous fiscal year. 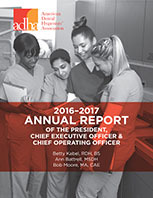 A new, streamlined and more graphical Annual Report was developed in 2016-17 to better convey all that ADHA does to support our members and the profession. Historically separate reports were submitted to the HOD. The challenge with this approach is that we typically want to write about the same things. On one hand this is good as it illustrates collaboration and partnership between members and staff. But it also results in more to read, redundancy and duplication of work. We hope you like this year’s new report and look forward to your feedback! 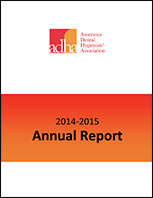 The Annual Reports are available as PDF files. If your computer isn’t configured to access PDF files, you may download the most recent version of Adobe Acrobat Reader software for free from the Adobe Web site. It's available for both IBM compatibles and Mac. After downloading the software, follow the text files for directions on how to install the software on your computer.